“A team headed by the TUM physicists Alexander Holleitner and Reinhard Kienberger has succeeded for the first time in generating ultrashort electric pulses on a chip using metal antennas only a few nanometers in size, then running the signals a few millimeters above the surface and reading them in again a controlled manner. 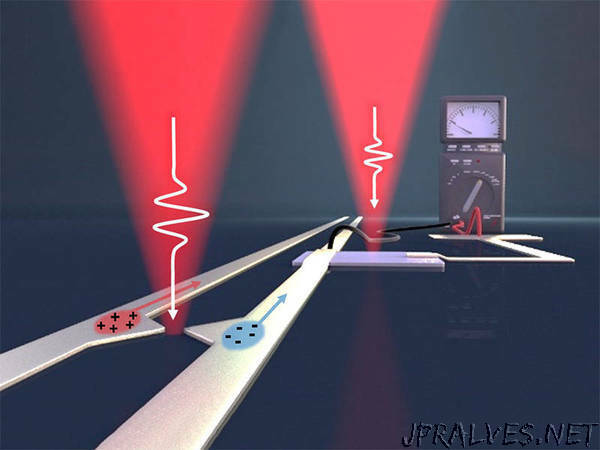 The technology enables the development of new, powerful terahertz components. “Such fast, nonlinear on-chip pulses did not exist hitherto,” says Alexander Holleitner. Utilizing this effect he hopes to discover even faster tunnel emission effects in the antennas and to use them for chip applications.